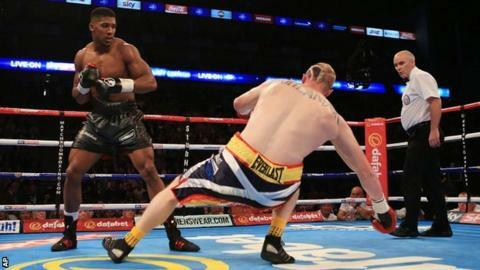 Anthony Joshua won the Commonwealth heavyweight title in only his 14th pro fight with a first-round stoppage of Scotland's Gary Cornish in London. Londoner Joshua, 25, floored Cornish with his first right hand thrown in anger and the referee waved things off after a second knockdown. Joshua, a former Olympic champion, now has 14 knockouts from 14 paid fights. Dillian Whyte stayed on course for a grudge match against Joshua in December with a knockout of Brian Minto. The 28-year-old Cornish, who was previously unbeaten in 21 fights, had a one-inch height advantage and was also heavier than his rival. But once Joshua let his hands go, the outcome was all too familiar. Joshua, who needed only 97 seconds to dispose of Cornish at the O2 Arena, has needed only 26 rounds to see off his 14 opponents so far and nobody has taken him beyond the third round. "It was a perfect connection and he went tumbling down," said Joshua. "If I take my time, it could be me on the end of one of those blows in five rounds or so." His fight against Whyte, which promoter Eddie Hearn confirmed would take place at the O2 Arena on 12 December, will be for the Commonwealth and vacant British title. Whyte defeated fellow Londoner Joshua in the amateur ranks and taunted him during the build-up to Saturday's show, calling him a "scumbag" and a "fake". Consequently, Whyte was booed into the ring before putting on a one-sided, yet ragged, display against his 40-year-old American opponent. Minto, a former cruiserweight world title challenger, was floored by a straight right hand at the end of the first round and was down again at the start of the third. The initial damage was done by a right hand behind the ear, before a left finished the job. Minto required attention from paramedics, but walked away from the ring unaided. "It wasn't the cleanest display, but I did get the job done," said Whyte, 27, who is now undefeated in 16 pro contests, with 13 knockouts. "I was carrying a heavy shoulder injury. But I'll show up in December, don't worry about that, even if I am on one arm or one leg. "I know the Joshua fight is going to be a good, hard fight but I'm in the game to put on good fights, test myself and reward the fans." Asked whether Whyte's victory over him in the unpaid ranks had any relevance, Joshua replied: "Of course, he's one nil up, so it's nice to have the chance to even the score." Former GB amateur star Charlie Edwards won the English flyweight title in only his fifth fight, outpointing Louis Norman. John Wayne Hibbert gained revenge over Dave Ryan with a 10th-round stoppage, landing the Commonwealth light-welterweight title in the process. Essex boxer Hibbert, beaten by Derby's Ryan in May and also in 2013, was outboxed for most of Saturday's fight. But Ryan appeared to pull a muscle in his back in the 10th round and Hibbert took full advantage, landing with a big right hand before the referee called a halt to proceedings.